Ethene, the simplest alkene, was known to chemists in the 18th century and was attained in pure form in the year 1794. Alkenes, as well termed olefins, are hydrocarbons that contain one or more carbon-carbon double bond(s). Because alkenes evidently contain less than the maximum number of hydrogen atoms, they are termed to as unsaturated hydrocarbons. Alkenes are often originated as plant products and in petroleum. Many alkenes are biologically active compounds. For instance, ethene induces ripening in fruit. In this chapter, we will discuss structure of alkenes, their spectral and physical properties, different process for their preparation and finally, we will learn their significant chemical reactions. Alkenes can be classified on the basis of the number of double bonds present in the molecule. Hydrocarbons containing one carbon-carbon double bond are termed monenes. The monoenes contain the common formula CnH2n. Hydrocarbons having 2 double bonds are termed diolefins or alkadienes or dienes. They contain the common formula CnH2n-2 and are isomeric via alkynes. Trienes contain 3 double bonds and tetraenes have 4 double bonds. The term polyene is utilized for hydrocarbons containing more than 4 double bonds. Compounds that have cumulated double bonds are recognized but are very uncommon. The conjugated dienes are the most significant among the dienes. They show certain reactions that are not given via monoenes or other dienes. Therefore, in this chapter, we shall concentrate our attention on monoenes and conjugated dienes. The carbon-carbon double bond is both a significant structural chapter and a vital functional group in organic chemistry. The form of the organic molecule is influenced via the presence of the double bond that is as well the site of most of the chemical reactions that alkenes undergo. So it is required to understand the structure of such molecules. Carbon-carbon double bond is the distinguishing feature of the monoenes and dienes. We have already learnt about the bonding of monoenes in chapter 1 of this course and learnt that the carbon atoms involved in double bond formation are sp2 hybridized. The bond angle around the sp2 hybridized carbon atoms is 120o. Bonding in dienes with isolated double bonds is similar to monoenes. Therefore here we shall discuss π bonds in conjugate and cumulated systems. Each of the 4 carbon atoms of butadiene encloses unhybridised p-orbitals. 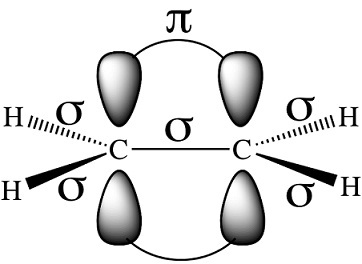 The sideways overlap of unhybridised p-orbitals provides increase to 2 localized π bonds, for example the bonds between C1 and C2 and C3 and C4. The 4 carbon atoms and the 6 hydrogen atoms of butadiene lie in similar plane so that there is a certain amount of overlapping between the electron clouds of the p-orbitals of C2 and C3. This give rise to completely delocalised π -orbitals spread over all the four carbon atoms. It is this delocalization of π electrons that imparts stability to 1, 3-butadiene. In common, the physical properties of alkenes are like to those of the analogous alkanes. Like alkanes, the boiling points of a homologous series of alkenes increase 20-30K per CH2 group except for the very homologues. Like alkanes, branching in an alkene as well lowers the boiling point. Lower alkenes, from ethane to butane, are colourless gases, higher ones, from C5 - C15, are liquids and the rest are solids at temperature. Alkenes are slightly more soluble in water than the corresponding alkanes since the π -electrons are attracted to the partially positive hydrogen of the water molecules. In the UV spectrum, even though the ethylenic chromospheres shows an absorption band below 200 nm, yet it is not of much practical value as measurement of UV spectrum in this region is influenced via the absorption of air and solvent molecules. The IR spectra are fairly utilizes for structure determination of alkenes. The asymmetrical alkenes are polar and absorb in the region between 160 and 1700 cm-1, while the symmetrical ones, being nonpolar, don't absorb in this region. Additional, depending upon the substituent, one or more bands of medium intensity appear in the region between 3000 and 3100 cm-1 for >C=C-H stretching. The cis-and trans-isomers of the type RCH=CHR might be illustrious via C-H deformation frequencies. The cis-isomer absorbs at 675-730cm-1 and the trans-isomer at 960-975cm-1. In the IR spectra of allenes, a band near 1950 cm-1 appears for the C=C stretching vibration. The strong band at 850cm-1 arises from >C=CH2 wagging and is characteristic of allene. The characteristic -C=C- stretching frequencies in conjugated systems is lower and appears around 1600 cm-1. In the nmr spectra, the chemical shifts of olefinic protons are shifted towards lower field than those of alkane protons. The exact position of absorption based on the location of the double bond in the hydrocarbon chain. In common, proton on the terminal alkenyl carbon absorb near ∂ 4.7 ppm, while the protons on the nonterminal carbon absorb slightly farther downfield at ∂ 5.3 ppm. The protons α to a double bond (CH2CH = CHCH2) appear at ∂ 2.06 ppm. In conjugated dienes, the olefinic protons are more deshielded and consequently resonance due to thee protons occurs downfield. In conjugated dienes, the signal due to CH2 = protons appears at ∂ 5.3-5.7 ppm and that due to H - C = C proton at ∂ 4.0-4.5 ppm. In the nmr spectra of the allenes, the alkene hydrogen gives rise to signals at ∂ 5.7-4.7 ppm. In the mass spectra of alkenes, the molecular ion peak is usually distinct. The fragmentation of interest for alkenes is the allylic cleavage. Synthetically, alkenes are prepared via introducing a double bond in saturated hydrocarbons through elimination of atoms or groups from 2 adjacent carbon atoms. The consequence is the formation of a double bond between these two carbon atoms. Let us talk about each procedure in detail. Alkyl halides are transferred into alkenes via dehydrohalogenation. Dehydrohalogenation involves elimination of the halogen atom together by a hydrogen atom from an adjacent carbon atom. The elimination is brought about via treating the alkyl halide through a strong base. Therefore, bromoethane yields ethene whenever treated with potassium hydroxide in alcoholic solution. The function of hydroxide ion is to abstract hydrogen from the carbon atom subsequently to the halogen bearing carbon. The carbon halogen bond then cleaves resulting in double bond formation. The alkyl halides, in which halogen is attached to a terminal carbon, yield a single alkene but alkyl halides in which the halogen atom is attached to a nonterminal carbon atom and both adjacent position contain hydrogen atoms yield a mixture of alkenes. In the initial reaction, chlorobutane can lose hydrogen only from C2; consequently, it gives only one product, for example: 1-butene. Though, in the second reaction, 2-chlorobutene can lose hydrogen from any of the 2-β-carbon atoms and, therefore, it gives a mixture of 2-butene (80%) and 1-butene (20%). Now you might ask why 2-butene is the main product. Dehydrohalogenation follows Saytzeff rule which says that the more highly substituted alkene is the dominant product. An alcohol is converted into an alkene via dehydration, for example, elimination of a molecule of water. Dehydration needs the presence of an acid and the application of heat. In the case of secondary and tertiary alcohols other than 2-propanol, there exists the possibility of the formation of more than one alkenes. For example, in 2-butanol, hydrogen elimination can occur either from C1 or C2. The direction and the rate of reaction again follow the Saytzeff rule and hence 2-butenes, the more substituted alkene, is the major product and 1-butene the minor one. 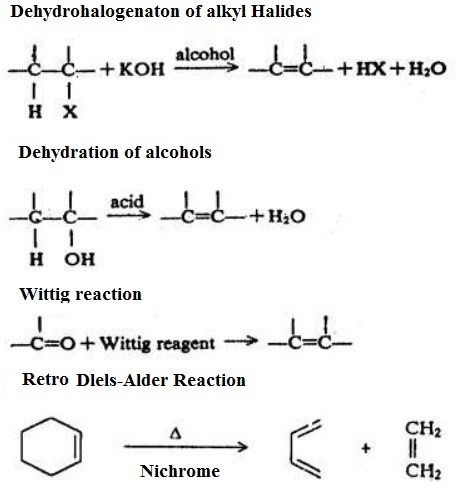 The ease of dehydration of various alcohols has been found to follow the order: tert > sec > p.
In the year 1954, George Witting reported a method of synthesizing alkenes from carbonyl compounds. This reaction is applicable to aldehyde and ketones and leads to replacement of carbonyl oxygen via the group=CRR' (where R and R' are hydrogen or alkyl group). This phosphonium salt further reacts by a strong base, that abstracts a weakly acidic α-hydrogen to give alkylidenetriphenylphosphorane (the phosphorous ylide) commonly recognized as the Wittig reagent. The phosphosrous ylide has a hybrid structure and it is the negative charge on carbon that is responsible for their characteristic reactions. The consequential phosphorous ylide attacks the carbonyl carbon to form betaine that often undergoes elimination spontaneously to yield alkene. Betain: A molecule having non-ajacent charges opposite. The mechanism of Wittig reaction has been the subject of much discussion, BUT evidence is now strongly in favour of formation of an intermediate betaine followed via ring closure and then fission. Retro Diels - Alder Reaction: Dienes are usually prepared by the adaptation of the methods used to make simple alkenes. Though, 1, 3-butadiene is prepared via passing vapours of cyclohexene over heated nichrome (Ni-Cr-Fe) alloy. This reaction is as well recognized as the retro Diels-Alder reaction as it is the reversal of the Diels-Alder reaction which we will study in due course. Other Methods for Preparation of Dienes: As stated above, dienes are usually prepared by adaptation of the method used to make simple alkenes. For example, 1, 4-dihydroxybutane on treatment with sulphuric acid gives 1, 3-butadiene. m. Many alkenes are biologically active compounds. For instance, ethene induces ripening in fruit. In this chapter, we will discuss structure of alkenes, their spectral and physical properties, different process for their preparation and finally, we will learn their significant chemical reactions.